SB400 Crockett County, Texas, USA. The plants of this variety have very short spines. Altitude range: 600-1800 metres above sea level. Habitat: Chihuahuan desert scrub, flats, rarely rocky slopes, mostly on alluvial substrates, among riparian vegetation. Occasionally in limestone rocks, in various substrates including open habitats. Echinocereus enneacanthus Engelm. in Wisliz. Mem. Tour N. Mexico [Wislizenus] 111-112. 1848. Echinocereus dubius (Engelm.) Engelm. in C.F.Först. Echinocereus enneacanthus f. cristata hort. 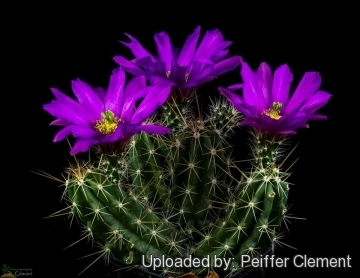 Echinocereus merkeri Hildm. ex K.Schum. 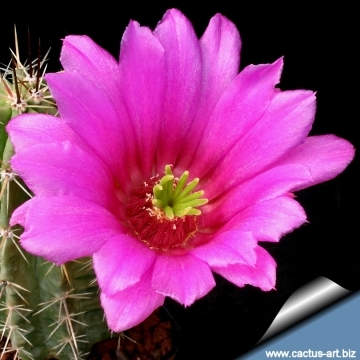 Description: Echinocereus enneacanthus subs. 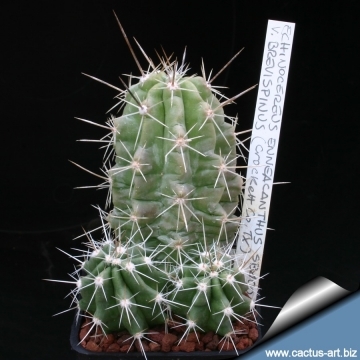 brevispinus is a caespitose cactus forming dense or lax flat-topped or rounded clumps either loose decumbent, or erect with 15-100(or more) branches, usually branching before flowering. It differs from var. enneacanthus for it thinner, and slender stems, areoles more closely set on the ribs and shorter spines. Except for differences in stem size, the habits of both var. enneacanthus and var. brevispinus are similar. Echinocereus enneacanthus and Echinocereus enneacanthus subs. brevispinus intergrade, at least in Maravillas Canyon and in the lower canyons of the Rio Grande. It seems best at present to regard enneacanthus and brevispinus as conspecific. Derivation of specific name: The root word brevi is after the Latin brevis, which means short. Stems: Up to 5 cm diameter up to over 100 cm long, The stems of this species are soft bright green and often remain wrinkled. The stem surface is readily visible through the relatively short spines. Areoles: circular, 10-15(-24) mm apart. Radial spines: Needle-like brownish, bulbous at the base (6-)8-9(-13) per areole, 10-20 mm long. More straight compared to typically curving central spines of var. enneacanthus. Central spines: Short and divergent 1-2 (to 3) per areole, 10-45(55) mm long. Flowers: Purple-red to pink in varying shades, and diurnal. Blooming in spring (April-May). Similar in size or larger , to 8 cm long and 10 or more cm in diameter, compared to those of var. enneacanthus. Throat darker red. Filaments greenish or pinkish. Anthers yellow. Stile to 3 cm long, 1.5-2 mm thick with 6-12 green stigma lobes. Fruit: Round pale green becoming or dull brownish-red, or ultimately turn red 25-38 mm long, 25 mm in diameter, pulp pale to intense pink. The fruit are edible. After the spines are removed from the green-brown flesh of the fruit, it can be eaten and tastes similar to, hence the name straswsberry cactus. Seeds: Black, ovoid, 1-1.4 mm long, and prominently tuberculate. Echinocereus enneacanthus Engelm. in Wisliz. : (subsp. enneacanthus) has stems that are 5 to 25 cm thick; Central spines long and divergent 1-5 per areole, 55-95 mm; radial spines curved up to 4 cm long. Distribution: Big Bend region of the Trans-Pecos, ans west to El Paso. Echinocereus enneacanthus subs. brevispinus (W.O.Moore) N.P.Taylor: has stems that are less than 5 inches thick; Erect and straight central spines and radial spines that are les less than 1.5 cm long. Distribution: New Mexico, south Texas and northern Mexico. Echinocereus enneacanthus f. cristata hort. : crested form. 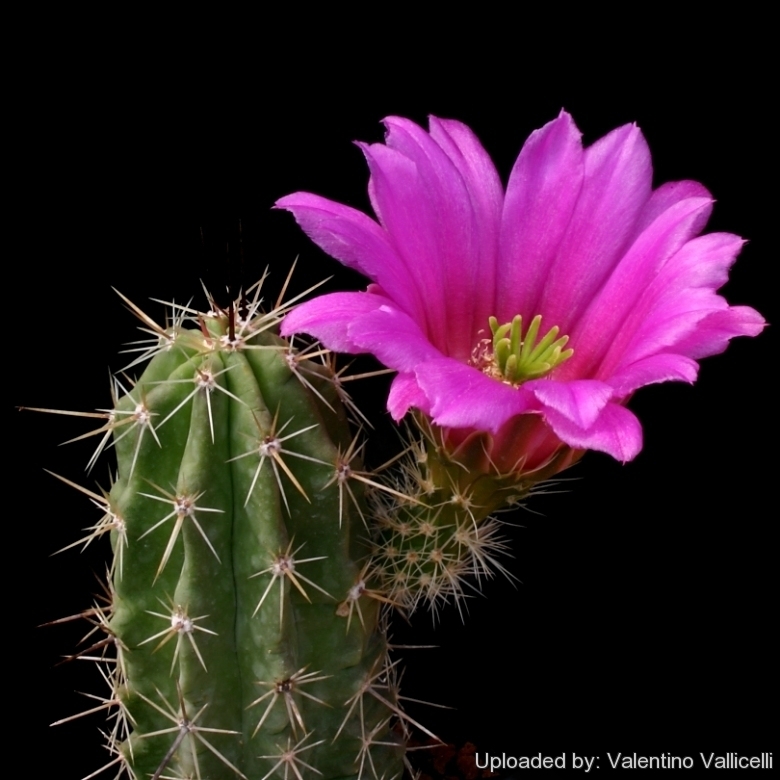 Echinocereus sarissophorus Britton & Rose: has a stout, stubby habit and very long, usually stiff, often bluish spines. Distribution: Coahuila and Chihuahua, Mexico. 1) Goettsch, B.K., Gómez-Hinostrosa, C., Heil, K., Terry, M. & Corral-Díaz, R. 2013. Echinocereus enneacanthus. In: IUCN 2013. "IUCN Red List of Threatened Species." Version 2013.2. <www.iucnredlist.org>. Downloaded on 16 January 2014. Propagation: Cuttings that are left out to callus off before planting. Also can be grown from seeds.